UNITED NATIONS, April 13 -- Is the UN better served by answering questions or evading them? On Monday of this week, the UN postponed -- and unceremoniously removed from the walls of its lobby -- an exhibit to commemorate the 13th anniversary of the beginning of the genocide in Rwanda. Inner City Press: About this Rwandan exhibit that got cancelled... I've seen a story that it's going very soon to be reopened. Can you provide an update as to when it is going to reopen? And also, there is some talk that... Will the language of the new exhibit be shown to the Turkish Mission prior to being put up? The Turkish Mission says that they are not the only country that complained, and I understand that they have complained, I guess, to the Office of the Spokesperson. Could you explain better, why it got cancelled and what steps will be taken before it's redone? Deputy Spokesperson: First of all, it was not cancelled -- it was postponed. And at the time that we mentioned that had happened, we said that it was because the review process had not been properly followed. That review is ongoing, which I mentioned to you, and I was hoping that I would be able to announce to you today, when the exhibit would open. I don't have that date today, but I am hoping I will have something in the next couple of days, and our aim is to have the exhibit opened by the end of next week. So while the review process in ongoing, I don't think I can comment further right now. Inner City Press: In terms of what triggered the postponement, did Turkey or other countries -- and if so, which -- complain? Deputy Spokesperson: I work in the Spokesman�s Office and I was not in receipt of any complaints. Deputy Spokesperson: The review process is under way, Matthew. I don't know right now. Question: You will tell us afterwards, then? Given that a week had passed, it seems fair to ask, "Are you going to show the revised language to the complainant?" That is, is it UN policy to give veto rights over exhibits, or rights to prior review? Inner City Press is informed of a situation some years ago in Geneva, in which a DPI map showed indigenous people all over the world. One of the countries -- the native land of the outgoing head of DPI -- objected, and the whole map came down, and never went back up. In this case, it is said, from the highest levels, that the Rwanda exhibition will see the light of day. Who will it first be shown to? Apparently, the UN will disclose this only after the fact, if then. Does this serve the UN? Later on Friday, a (very) senior UN official, who later specified that comments made were "on background," which the Spokesperson's Office clarified meant they could be used as a "senior UN official," expressed "regret" that "this administrative review" of the postponement of the genocide exhibit has been "misunderstood." This person said that "DPI will announce the future program shortly" and that "genocide should be squarely addressed," while referring to the "Armenian massacre." A distinction was made between principle and practicality. Which was exhibited, in taking down the Rwanda genocide exhibition? Questions of genocide, and apparently of whether a country has indigenous people or not, are hot button issues. But ever simpler questions are left unanswered. 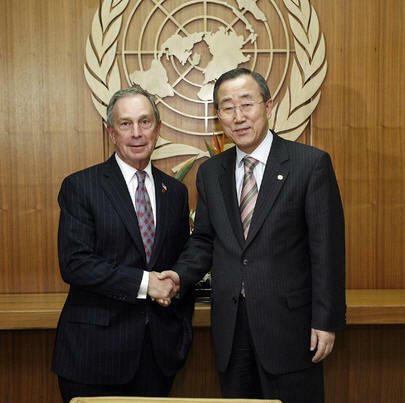 On Wednesday of this week, Mayor Michael Bloomberg came to the UN and met with Ban Ki-moon. He bought New York Fire Department officials with him, and Inner City Press asked why. 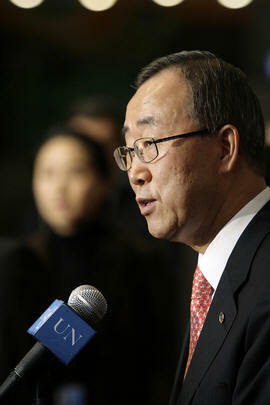 The Deputy Spokesperson said that the FDNY had conducted an inspection of the UN in late 2006. This is interesting because of the issues surrounding the applicability of local and federal law, including the First Amendment, inside the UN's compound facing the East River. On Friday afternoon, while chief UN legal officer Nicolas Michel took lengthy questions from the press, initially about the proposed Lebanon tribunal, Inner City Press asked him whether as a matter of law the FDNY inspection had been voluntary. Mr. Michel said he wouldn't answer the question, and went on to take many follow-up questions about his upcoming trip to Lebanon. Video here. Even on his way to the elevator, he would not take the question. Inner City Press went and posed the question to the Deputy Spokesperson, who said that "it is not really an Office of Legal Affairs issues." Then whose issue is it, allowing an inspection by local fire authorities? "I'll have to ask," was the response. As of 8:30 p.m. Friday, there had been no response. Therefore, we left noting that sources say that the FDNY is establishing a presence inside the UN headquarters, and that New York City officials have concerns, which the UN has not disclosed, about the UN's Capital Master Plan. Is the UN served by not answering? The questions will continue next week. UNITED NATIONS, April 11 -- As the UN moves toward fixing its headquarters building, while New York's Mayor Michael Bloomberg announces a rare municipal climate change plan, Ban Ki-moon and Bloomberg met Wednesday surrounded by issues, surrounded by aides. UN spokeswoman Marie Okabe after the meeting said that among the topics covered were how the UN's fix-up, called the Capital Master Plan, could harmonize with the City's goal of reducing carbon emissions. Inner City Press asked about the attendance of NYC Fire Department officials. "There was a Fire Department inspection" of UN Headquarters, Ms. Okabe said, specifying that the inspection took place in late 2006. Now, she said, UN Under Secretary General for Management Alicia Barcena will be following up with the Fire Commissioner. Because the UN's campus is international territory, longstanding issues of immunity have more recently flared into tabloid Press stories earlier this year about rats and eels in the UN and no NYC inspections. Ms. Barcena has told Inner City Press not to expect the Capital Master Plan to be changed from the current version, involving the construction of a temporary "swing space" on the UN's North Lawn, to larger plan for a new tower south of 42nd Street. Marie Okabe repeated this on-camera on Wednesday, click here for video. Messrs. Bloomberg and Ban on April 11: can carbon emissions be reduced? Mayor Bloomberg's public schedule for Wednesday, distributed to City Hall reporters at 7 on Tuesday night, included stops at Public School 61 in Queens and at Columbia University, with no mention of the United Nations. Inner City Press and others asked the UN press office if Mayor Bloomberg would stop and answer a few questions. The response was, "Ask City Hall." Wednesday afternoon, after having escorted take-no-questions Mayor Bloomberg to his waiting SUV, Ms. Barcena mentioned the Bloomberg-convened climate change summit announced earlier in the day. It is slated for May 14-17 and according to City Hall's press release will involved "mayors from more than 30 of the world's largest cities, including London, Paris, Tokyo, Mexico City, Sao Paulo, Moscow and Istanbul. Private sector companies will also be represented through sponsorship of sessions and events, and having CEOs in attendance. These companies include: JP Morgan Chase & Co., Alcoa, Deutsche Bank, the Hearst Corporation, the Shell Oil Company, Siemens, Time Warner, BSKYB, Citigroup, Con Edison, Federated Department Stores, General Electric, Keyspan, KPMG LLP, Swiss Re, and Tishman Speyer." This litany is not unlike the UN's Global Compact, in which large companies sign on to high-minded principles without necessarily changing their practices. Musing reporters asked Ms. Barcena what another item on the agenda, the City's help with Peacekeeping, could possibly have met. Marie Okabe had referenced New York's "diverse" police force. Police Commissioner Raymond Kelly has been involved in security in Haiti, and Bernard Kerik in other places, including for profit. It seems those topics did not come up, nor the UN's allowance of smoking in Mayor Bloomberg's smokeless city. Among the UN correspondents waiting in the lobby, to try to ask Mayor Bloomberg questions, a story emerged of a more recent rodent sighting in the Delegates' Dining Room, reportedly photographed by a visiting Brazilian judge. The same was heard later from diplomatic sources, which in the UN makes the story true, or as good as true. We will have more on this. UNITED NATIONS, April 10, updated 8 pm -- As the UN Security Council on Tuesday discussed the breakaway republic of Abkhazia, Georgia, the U.S. and Russian Ambassadors traded diplomatic barbs about a man who wasn't there. Amb. Wolff said that Russian Ambassador Churkin was being "mischievous" and making "theater," by ignoring speakers in chamber and walking out of the Council. Amb. Churkin laughed when told of this characterization. "I have to be very careful walking around this building," he said, recounting that he left to deliver a speech in the First Committee of the General Assembly, about disarmament, pursuant to Russia's "important political and intellectual role" on the issue. There was a momentary opening to bring several UN issues together, and Inner City Press took it, asking Amb. Churkin if he had seen a photo exhibition about Abkhazia that is up on the walls in the UN's basement by the Vienna Cafe. The exhibit includes photos of Georgians being shot and killed in the streets of the Abkhaz capital of Sukhumi in 1993, and includes not-entirely-clear quotes about genocide and ethnic cleansing. "Yes," Amb. Churkin replied. "It's one-sided. It's unhelpful... One side is engaged in a massive campaign. But they chose to do it." "But you don't think that countries should block each other's exhibition," asked Inner City Press, referring to Turkey's blocking earlier in the week of a memorial to the Rwandan genocide, due to a reference to "one million Armenians murdered in Turkey." "I don't want to generalize," Amb. Churkin said. He again called the Georgian exhibit "unhelpful" and "bad propaganda," but said Russia had "decided it was not the situation we should shake the tree." One observer noted that Russia should be given credit for not trying to have the exhibition cancelled. China, for example, did try to cancel an exhibition sponsored by a non-governmental organization from Taiwan, and more recently got a Taiwanese presentation removed from a UN web cast, click here for that story. Some analogize between China's position on Taiwan and Turkey's activism in opposing any characterization of Armenians' deaths just before and during World War I as a genocide. The same word, applied in Georgia's exhibition about Abkhazia, does not draw the same vehemence from Russia. Perhaps it is because Russia has a handful of such issues, from Chechnya (which it wants to keep) to Kosovo (which it wants Serbia to be able to keep) to South Ossentia (which, like Abkhazia, Russia would like to see break away from Georgia). U.S. Ambassador Wolff disputed Russia's analogy between Abkhazia and Kosovo. Amb. Churkin had said, Imagine the Security Council considering Kosovo while only hearing from the Serbian side. Last week the Council heard the Kosovar position, albeit in a non-formal Arria style proceeding. Some wonder: what is the distinction in barring the Abkhaz side, other than the foreign policy of the host country? And what is the difference between Georgia's Abkhazia exhibition's use of graphic photos, for example of a dozen men shot dead and bleeding on the ground in September 1993, and of the word genocide and the unceremoniously postponed Rwanda exhibit, with its inclusion of "one million Armenians murdered in Turkey" on a display headed, "Genocide: whose responsibility"? For the record, the mandate of the UN's Mission to Georgia is set to expire on April 15, so a vote to extend it is expected on Friday, April 13. In town to do Russia's heavy lifting is their specialist on Abkhazia, Vladislav Chernov. In New York on Tuesday, Mr. Chernov told reporters to expect the investigative report on the Kodori Gorge military incidents -- which include alleged Russian use of helicopter gunships -- in two weeks. 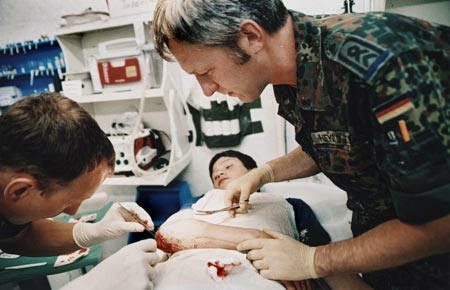 The thumbnail background is that Abkhazia de facto broke away from Georgia in September 1993. The Georgian exhibition currently on display at the UN states that "under threat of death the local inhabitants were expelled from the territory of Abkhazia," and puts the number of expellees at 250,000 Georgians and 100,000 others, listing "Russians, Armenians, Greeks, Jews, Ukrainians and Estonians." With the mixing of territories and religions, one wag wonders if there is not some double-counting. One exhibit mis-spells the word "seazure" (for seizure), calling into question the statement that all such exhibition are reviewed by the UN Department of Public Information, click here for video of that statement. The Georgian exhibition includes a 1993 quote attributed to Russia's then-foreign minister, that "Everything, that is happening in Sukhumi is ethnic cleansing." Given that it is Georgia, and not Russia, which states that votes held in Abkhazia are illegitimate because of the ethnic cleansing of ethnic Georgians, the quote seems strange, purportedly having come for a Russian foreign minister. Inner City Press asked the Russian mission's spokeswoman, who in turn asked rhetorically, ethnic cleansing of whom, by whom? "That's what you should ask him," she said. But Georgian Prime Minister Mr. Zurab Nogaideli spoke only very briefing to reporters outside the Security Council. Inner City Press asked about Georgia's lawsuit against Russia in the European Court of Human Rights. The Georgia Prime Minister refused to comment on the case. Click here to view; click here for the Court's Registrar's release on the "Inter-state application brought by Georgia against the Russian Federation." While the Security Council was meeting on Tuesday, the foreign ministers of South Ossentia, Abkhazia and Transdniestria -- Murad Dzhioyev, Sergei Shamba and Valeri Litskai, respectively -- were slated to meet in Sukhumi, forming their Association For Democracy and Peoples Rights, a/k/a Club of Breakaway Republics. Some wonder why Nagorno-Karabakh is not included. In any event for now the meeting was reportedly postponed, due both to the hospitalization of Abkhaz president Sergei Bagapsh and to a decision to wait for the Security Council slated Friday vote on its extension of the UN's Mission to Georgia. At deadline, the Abkhaz government's web site still called the breakaways' meeting "ongoing." We'll see. Inner City Press: On Abkhazia, if the self-styled prime minister of Abkhazia sought to attend, would the host country grant him a visa, at this time? Ambassador Wolff: The issue hasn't come up. Inner City Press: Could you say why in the past the U.S. didn't do it? Ambassador Churkin has said that last time, six months ago, when they met on the extension, that he was not allowed to attend. Ambassador Wolff: We have a political process underway through a group called the friends of Georgia, that's focusing on conflict resolution and negotiations with the parties, there are considerations related to that, and all members except the Russian Federation believe that the timing is not appropriate, that it would be counter productive, that it would not contribute to the efforts underway to try to deal with this issue through a conflict resolution process that the Friends are leading. With Friends like these... The just-issued Secretary General's report on Abkhazia mentions a Geneva meeting of the Group of Friends, chaired by UN Peacekeeping's Jean-Marie Guehenno, with the participation of Abkhazia's "de facto Foreign Minister Sergey Shamba." So apparently, this "de facto" foreign minister can attended UN-chaired meetings in Geneva, but cannot enter the United States. At least not at this time. The Abkhazia report also recites that "late in the evening of 11 March... five helicopters has approached the upper Kodori valley from the north and fired rockets at the villages of Chkhalta and Adjara... The investigation is still in progress." 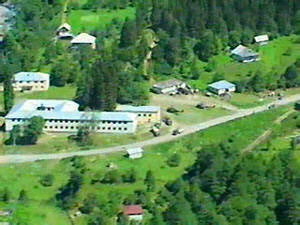 The alleged motive is that the target was the seat of the pro-Georgia Abkhaz government-in-exile, which was commissioned by Georgian president Saakashvili. ...there have been allegations in various things, that it was the Russians. But, how seriously is the U.S., but also the Security Council, taking this issue, if it does turn out that a permanent member of the Security Council might have been involved in firing helicopter gun ships in another country's territory, what kind of recourse might there be, what kind of discussions might we be seeing, you know, over the coming days? Ambassador Wolff: Well, I've not seen any conclusions from the report yet, I know there's an investigation either way. Clearly, as you stated, any attack on a sovereign country is to be taken very seriously, we will evaluate the reports, we will be discussing it with the experts who conducted it, we have a meeting set up next week as you know on the renewal of UNOMIG, the Georgian prime minister will come, we'll hear from special representative Arnault, and I'm sure this will figure prominently in our exchanges to try to get to the bottom of this. But again, breakaway Abkhazia's "de facto" Foreign Minister Sergey Shamba will not be present, according to Amb. Wolff's response. "At least you got an answer," another correspondent whispered to Inner City Press. It was not so easy getting a quote from the UN about its follow-through on its statement, following the military coup in Fiji in late 2006, that it would not use more Fijian troops as peacekeepers until democracy was restored. Click here for that story. And while UK Ambassador Emyr Jones Parry stopped to take a question about the UK's policy on whether the UN, post-coup, should use Fijian peacekeepers, his answer was, "I won't know if we have a policy on that." Honest, at least. UNITED NATIONS, April 3 -- After a full day of positioning in the Security Council on resolving Kosovo's status, the question of what precedent independence for Kosovo would set inevitably arose. Inner City Press asked U.S. Ambassador Alejandro Wolff how, for example, Kosovo and Serbia could be distinguished from Abkhazia and Georgia, and secondarily, why the U.S. had denied a visa to the (self-styled) Foreign Minister of the (breakaway) Republic of Abkhazia. Amb. Wolff on-camera responded to the precedent question, while not explaining the visa denial. Amb. 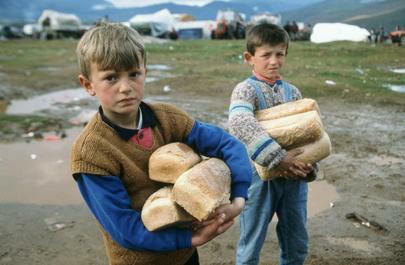 Wolff pointed out that Kosovo has been administered by the U.N. for seven to eight years. In response to a question of whether the U.S. believes that international law permits the Security Council to grant independence to a part of a previously sovereign country, Amb. Wolff said that the Security Council is international law. This is a statement that will need some follow-up. Next up was Martti Ahtisaari, who joked that he hoped there were no questions left for him. There were, of course, questions, including from Inner City Press whether he deems productive Russia's two suggestions, that the Council members visit the region, and get a report on implementation of Resolution 1244. Mr. Ahtisaari answered diplomatically that it is entirely up to the Council. UK Ambassador Emyr Jones Parry, the Council's president this month, patiently took questions. He said the day had been productive. On the question, from Inner City Press, of Kosovo as precedent, Amb. Jones Parry went back to 1389 (the year, not the resolution), then said that in 1989 Milosevic "threw a bomb," leading to the next "twenty years" -- he corrected himself, "eighteen years." But what then of Nagorno-Karabakh? After Amb. Wolff had ceded the stakeout microphone to Mr. Ahtisaari, a U.S. official who asked to be identified as such explained that the U.S. visa had been denied to the so-called Foreign Minister of Abkhazia without violating the U.S.'s obligations as UN host country. Abkhazia is not a country, he said, and the (non-) foreign minister wasn't seeking to travel to an official Security Council or UN meeting, but rather an Arria style meeting. (Yes, see foreshadowing above.) "For bilateral reasons, the visa was denied," he said. Inner City Press: On Georgia, Ambassador Churkin said that the Abkhaz foreign ministry called him, a person from Abkhazia. Was the U.S. embassy in Moscow didn't give him a visa in exchange for somehow changing the language of the resolution on Georgia -- is that your understanding of what happened? He said it right here. Ambassador Bolton: I have -- yeah, you know, I have no idea what that's about. Sources told Inner City Press, however, that not only had Amb. Churkin made his statement about the visa in a televised interview which the U.S. State Department presumably monitors, but also that the visa issue had been discussed in the Security Council consultations prior to Amb. Bolton's above-quoted answer. Can what is said outside the chamber be entirely believed? Back in October 2006, the U.N. Mission in Georgia was extended for six months, which now run out mid-April. In the interim, there are allegations of Russian helicopter gunship firing in the area, and Georgia has filed suit in the European Court of Human Rights for Russia's round-up and deportation of Georgia. In the Council, and not only on Kosovo, expect fireworks.